The Arabian horse has captivated mankind for centuries with its beauty, intelligence and stamina. It is regarded as the most influential breed in the world. The Bedouin of the Arabian Desert created the oldest and purest breed of horse in the merciless terrain of their homeland. They used their prized steeds as a tactical advantage in tribal warfare, carefully breeding for mounts with great courage and endurance. Arabian horses were an integral part of the Bedouin family and were often found in the tents of their masters. Women and children raised the foals with affection, fostering the kind, loving disposition that owners of Arabians still enjoy today. About 3500 years ago the Arabian horse assumed the role of king-maker in the east, including the valley of the Nile and beyond, changing human history and the face of the world. Through him the Egyptians were made aware of the vast world beyond their own borders. The Pharaohs were able to extend the Egyptian empire by harnessing the horse to their chariots and relying on his power and courage. This awe-inspiring horse of the east appears on seal rings, stone pillars, tombs and temples with regularity after the 16th century BCE. Egyptian hieroglyphics proclaim his value; Old Testament writings are filled with references to his might and strength. Other writings talk of the creation of the Arabian, "thou shallst fly without wings and conquer without swords." King Solomon some 900 years B.C. eulogized the beauty of "a company of horses in Pharaoh's chariots," while in 490 B.C. the famous Greek horseman, Xenophon proclaimed:" A noble animal …in all its beauty …something so lovely and wonderful that it fascinates young and old alike." During the early 19th century, the ruling families of Egypt gathered the finest horses from the deserts of Arabia and brought them to the land of the Pyramids. This extraordinary collection, unrivaled since the time of King Solomon, became the foundation for the modern-day Egyptian Arabian. Between 1895 and the mid-1980's, some of the best Egyptian Arabians bred in the Land of the Nile were exported to the United States. Those individuals and their desert ancestors form the nucleus of the Egyptian Arabian bloodlines in present-day North America. Today, horses from these rare and treasured bloodlines are carefully preserved to retain their unique qualities and a classic refinement valued worldwide. Although Wisconsin is know for a cool climate in contrast to the scorching deserts of Arabia, it has been a welcoming home for many imported Straight Egyptian Arabians over the years. *Farazdac, *El Maareekh, *Tuhutmos and *Akmar came directly from the desert. The redoubtable Nabiel stood in Wisconsin for most of his breeding days; Ruminaja Ali, El Halimaar were here for shorter periods. Sons and daughters of *Ansata Ibn Halima, *Ibn Hafiza, Shaikh Al Badi, Moniet El Sharaf and *Ramses Fayek, Thee Desperado, Fabo and Imperial Imdal progeny have grazed our green fields. 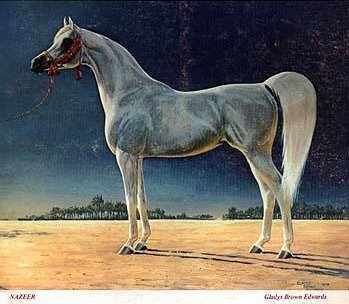 The famous mare Bint Deenaa was born here & her progeny through Anaza Bay Shahh & Anaza El Farid in particular has produced the highest winning Champions presently throughout the world.